Whitney has spent 37 days watching her fellow shelter mates be adopted into new homes, and she hopes it will be her turn next. She’s a big dog with a big personality to match! “Whitney is a large girl with lovely manners. Despite her size, she is very gentle,” said adoption attendant, Bec. At only five years of age, Whitney is full of love and life (watch her video and see for yourself!). Her funny antics always have us laughing and will bring plenty of entertainment to her new family. She likes to goof around and play, so if you’re up for a good time, so is she. 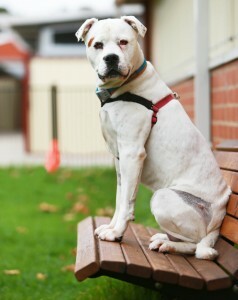 “Whitney can be quite playful and loves to run around. 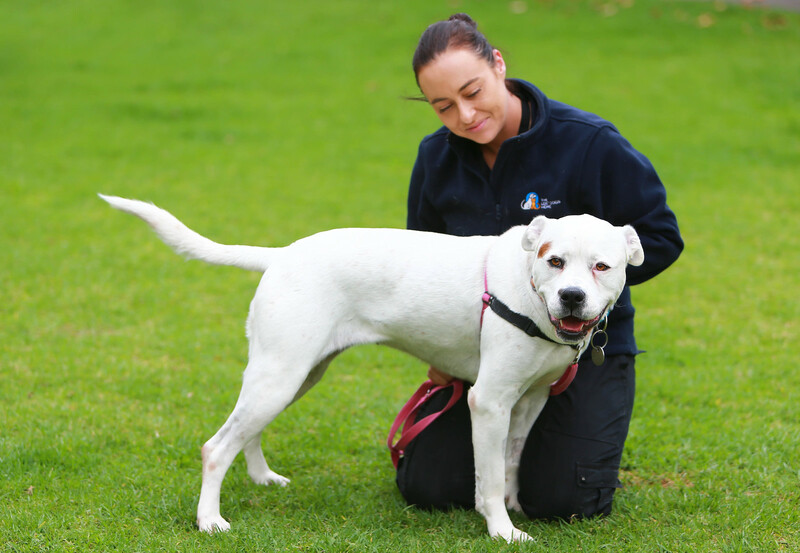 She enjoys a cuddle and a yummy treat, ” said Bec. Being calm and well-mannered around other dogs is something Whitney hasn’t yet mastered. She’s full of potential, and with training and leadership, we’re sure she can grow into a model canine citizen. “Whitney is very strong, but she knows how to walk well on the lead. She is looking for a family that is interested in ongoing positive reinforcement training, and that is happy to let her shine in her own time. She will bond strongly with her new family,” said Bec. Whitney has mild hip dysplasia in her left hip. This isn’t uncommon for a dog of her breed and size. It’s not causing any issues at the moment, and a good nutrition plan should help keep her happy and healthy. Does Whitney sound like your perfect match? If you’re ready to adopt a dog and want to meet this goofy giant, call the friendly adoptions team at our North Melbourne shelter or drop in for a visit. Whitney’s animal ID is 1009858.